Introduction: Following the success of their revolutionary PT freshwater series Quantum introduces an entirely new line of Performance Tuned Saltwater series rods and reels. The first new contender that TackleTour got a chance to examine is the aggressively styled Cabo PT. Impressions: Tricked-out, souped-up, and super-tuned is what "Performance Tuned" is all about. From the looks of the Cabo PT trolling reel you can tell Quantum put countless hours of engineering into the creation of this PT powerhouse. The one-piece aluminum frame feels solid and wears Quantum's new Saltgard six-layer finish, which guards against harsh ocean environments. 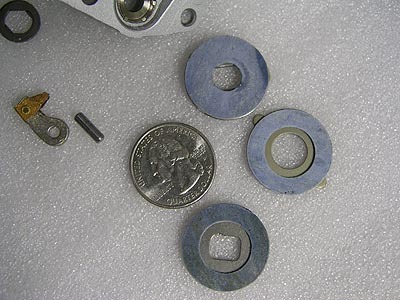 To protect the inner components, aluminum side covers are used and bolted on using button-head cap screws (hex screws). To compliment the brawny looking frame, heavy duty components were chosen, including the one-piece forged handle assembly that holds a comfortable ergonomic knob, solid star drag control, Magnum ceramic drag, and much more. The package also includes a neoprene reel bag, rod clamp, and a handy combination wrench and knot tool. 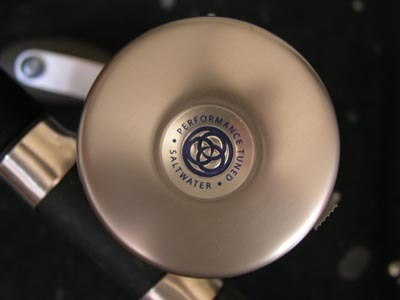 Saltgard Six-Layer Finish: The Saltgard six-layer finish was developed with the help of marine corrosion experts specifically for Quantum's new line of PT Saltwater reels. The most inner layer, is an anodized conversion coating that forms a dense molecular barrier on the aluminum. Then two different layers of corrosion inhibitors are added separately through an extremely high temperature process that will get into the tiniest pours of the aluminum. Finally to complete the Saltgard layers, a primer paint, base coat, and a clear coat is added for enhanced protection. 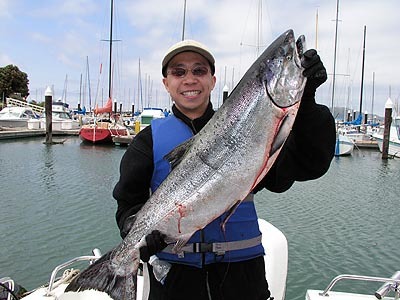 Real World Tests: Word has it that a few 50lb salmon have been caught just a little North of TT headquarters. As the end of salmon season nears on the West coast, we decided the perfect test was to troll the Quantum Cabo PT in search of these huge fish. In addition, we also employed these trolling reels for some jigging for rockfish and lingcod. The Components: What makes a good product isn't it's flashy exterior, but the combination of quality components, inside and out. Here we'll take a closer look at the chassis and guts of the Cabo PT trolling reel and see just how they held up on the water. The Drag: Harsh saltwater environments call for tougher parts and one of the most important components of a reel is a resilient drag. Saltwater fish vary in size greatly, and rarely give up easily. The Cabo PT Trolling reel features Magnum ceramic drag discs that exude the heat from fish during the fight. This proved to be true after we battled many salmon that gave the Cabo PT a excellent workout... pulling, diving, and running once near the boat. The drag on this reel was smooth time after time and no decrease in drag pressure was noticed during all skirmishes. The star drag system allows easy access to fine tuning the amount of pressure needed while battling fish. For our tests we set the drag to the highest setting and had to use heavy machinery to stress the drag system to no avail, no line was able to come off the spool, creating one of the best drag systems we have encountered thus far. And at full drag setting the reel can put an absolute stop to even a tuna, putting in consideration that you just might lose a fish because your line or rod snaps. 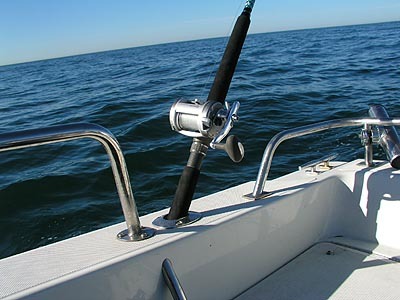 The Gears: While fishing in the ocean, you'll most likely hook a fish that's easily 30 pounds plus. To bring in such a sizeable fish requires the work of a powerful gearing system that won't let you down. We tested these gears while targeting salmon at 40 to 50 feet down and also monster lingcod from 100 feet below the surface. The solid brass alloy machined gears held up nicely, and brought immense fish to the boat without any problems. Having brass alloy gears also help provide excellent corrosion protection. The Frame: A zero-flex design is a must have for these reels. The frame of the Cabo PT trolling reel begins by die-casting premium grade aluminum and then further machined to ensure exact fit for all components. While fishing there were no signs of weakness in the construction thanks to the structurally sound one-piece frame. Deep sea fishing for rock fish and salmon with the new Quantum saltwater Performance Tuned reel was easy, problem free, and enjoyable. Retrieving: The Cabo PT conventional baitcast reel is a joy to use. With a firm grip on the oversized ergonomic handle knob, cranking is powerful and comfortable. Each turn of the one-piece forged handle is smooth and the same results are also seen under the load of a big salmon. The oversized brass alloy gear train is precisely machined to match and run smoothly in unison. That's not all. The entire system is supported by 4 PT bearings for an even smoother ride. In addition, the forged aluminum spool is solid and uniform, allowing the line to lay evenly on the spool while being retrieved. At the same time, it provides a glass-smooth free-spooling as the fishing line is being released. When free-spooling is off and the gears are engaged, the Cabo PT showed no signs of back-play during our field tests. But being picky, I noticed the handle had a slight give. This actually comes from the connection between the one-piece handle and the crank shaft. 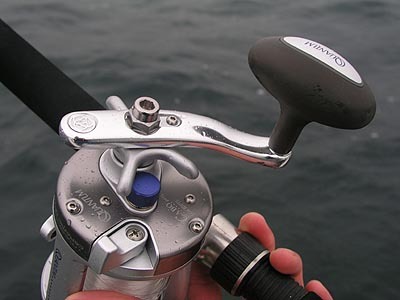 The slot on the forged handle where it goes into the crank shaft doesn't fit perfectly, and we have seen the same thing in many other conventional reels by other companies. This didn't pose to be a problem while we landed fish after fish, and by further tightening the screw it's almost unnoticeable. 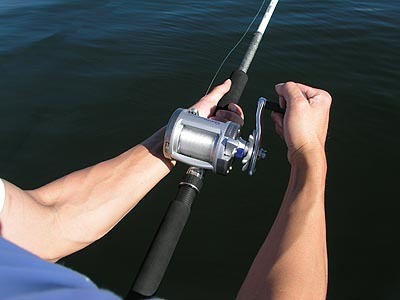 Durability: Durability is a must in all fishing products, especially ones for offshore fishing. Saltwater is no friend to your expensive tackle and you should do everything you can to maintain the integrity of the gears you use for big game. Quantum's Saltgard six-layer finish does a good job at protecting the abuse we put these reels. Dropping them down onto the deck of the boat after boating the fish, tossing them aside out of frustration after losing a huge one, or even just getting saltwater all over them. 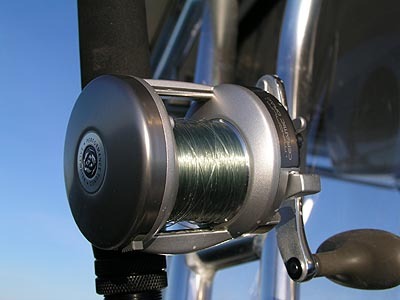 The reel did a superior job of taking exterior punishment along with protecting the inner parts of the Cabo PT. As you have read above, the drag and gear held up very well during the battles, and after the reel had a few hard days work, we re-analyzed the Quantum PT in terms of drag pressure, smoothness, and all mechanical functions of this light tackle saltwater product. The results are impressive, and the Cabo PT Trolling reel continues to perform flawlessly. Quantum's new Cabo PT showed no signs of wear, but how about corrosion? Let's just say that before we began our tests, the reel took a little dipping in the Pacific Ocean, then it was used for a few days but only received a quick rinse after each day, even though Quantum recommends cleaning and re-lubricating after each trip. So far visual examination of both the exterior and interior components shows no sign of corrosion at all. The aluminum frame, brass alloy gears, and PT bearings were able to withstand the rugged tests of offshore fishing. Furthermore, the PT bearings aren't your average off-the-shelve components. These are Quantum's very own, and for the saltwater line of reels they even placed them in a special polymer composite bearing cage to further protect them against any possible deterioration. Need Non-Levelwind? : No problem! 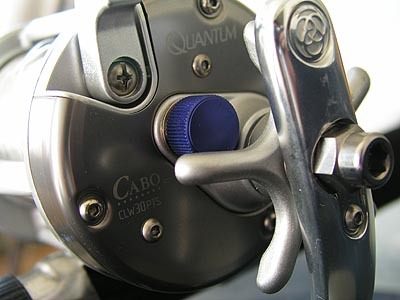 Quantum makes the same Cabo PT Trolling reel without a levelwind for those fish that really hit and run hard. This reel comes in the same sizes as the levelwind models, but the frame is built non-levelwind style. The performance? Just as superb as the CLW30PTs we described above. All the components are the same, the only different you will distinguish is the absence of the levelwind. 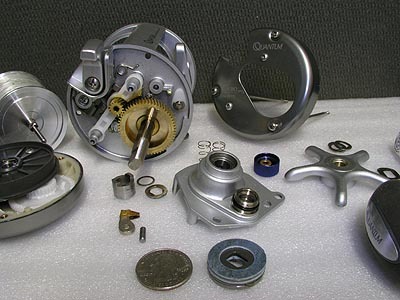 Warranty: Quantum has upgraded their warranty service for the Saltwater PT reels!!! These PT reels are warranted for one year from the date of purchase against any defects in workmanship or materials. But here's the exciting part that any saltwater guys will love. Quantum provides their users with a "24 Hour Warranty Service" because their objective is to keep everyone fishing, and they understand how important it is to have your gear ready, especially when the sea conditions are right and the migratory fish are biting. Two advantages to this service: 1) Quantum will either repair or replace your product in 24 hours and ship it back to you, 2) the warranty on the product being sent back to you will again have a 1 year warranty period from the date sent. This is a solid warranty, with the service to back it up. 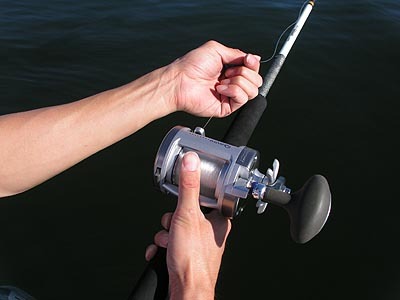 Replacement Parts: For saltwater tackle, especially reels, being able to easily find replacement parts for those damaged due to wear and tear is quite important. Quantum is continuing to add value towards their products, and coming soon anyone will be able to order replacement parts directly through Quantum's website. So no more worrying about not being able to find a replacement screw or washer years down the road. Conclusion: Any type of saltwater tackle needs to be built tough, to be able to fight winning battles with big game, and to last season after season. Quantum, having produced superb freshwater rods and reels in their PT series, has made a bold move into the saltwater arena. The newly introduced line of saltwater Performance Tuned rods and reels for both inshore and offshore applications. We had our hands on the Cabo PT Trolling reel, our very first saltwater reel made by Quantum, and we ran it through some of the most intense field trials out on the Pacific Ocean. The results are quite impressive, and the Cabo PT trolling reel performed with exceptional marks. The retrieve was smooth with and without the load of a big salmon, the ceramic drag system provided solid stopping power with precise pressure, and the reel's durability definitely deserves praise. The use of quality components including brass alloy gears, ceramic drag discs, and Quantum's new Saltgard six-layer protective finish make the Cabo PT a product that'll hold up to those unforgiving complications often encountered on the ocean. If light tackle offshore fishing is your game, and you're looking for something that's durable, performs well, and an incredible value, then look no further than the Quantum Cabo PT trolling reel.